View the account you are logged into and be able to Log out. View Connectors associated with your account. Import Photos from your device’s camera roll. Access app Settings for Sync, Camera and Report Settings. Send Feedback in an email to FotoIN Support. This is the best way to request help with problems you may be experiencing in the app. View your current App Version. 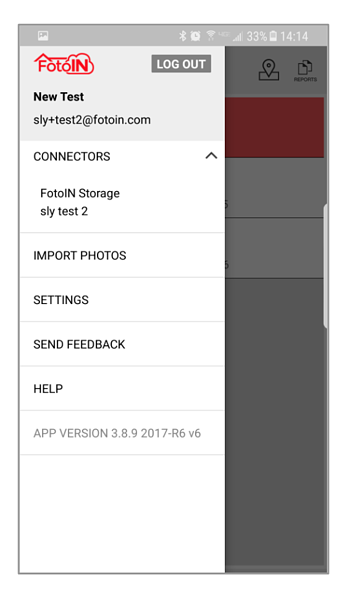 TIP: If your photos aren’t syncing to your storage account, verify under Connectors that you are connected to a company account and/or cloud account. 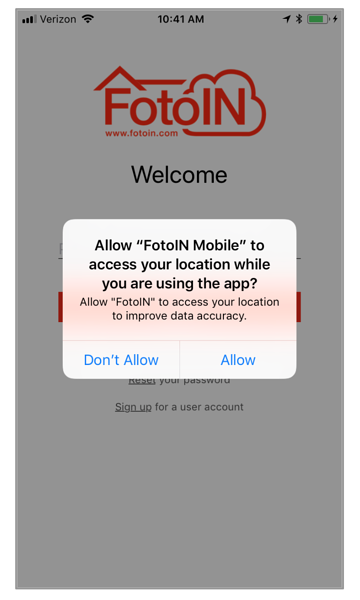 Location services must be turned on for FotoIN mobile to access your location ni order to capture GPS coordinates, know the correct address and preconfigured project location. When opening the app after install, a message will prompt you to allow access, tap ‘Allow’. To adjust this setting or ensure that it has been turned on, open the Settings app on your device, scroll down to FotoIN Mobile and tap ‘Location’. FotoIN Notifications are designed to send you a reminder whenever you enter a jobsite. Tap ‘Allow’ when prompted after opening the app for the first time. TIP: When logging into the FotoIN app for the first time. Go to Sync Settings and turn on Mobile Network Data so when your device is not connected to wifi, your photos and reports will still sync. Under Sync, swipe Mobile Network Data to ‘ON’ to enable sync over mobile network data when wifi is unavailable. Unanswered Questions: If you would like to include unanswered questions on completed reports, swipe right to turn this setting on. TIP: After allowing access to your location, you will be able to view the GPS coordinates and address from the Settings screen. Tap to refresh.